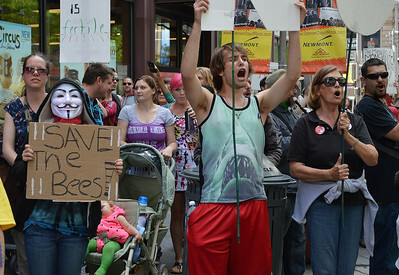 Anti-GMO protesters with signs about bees and food safety. 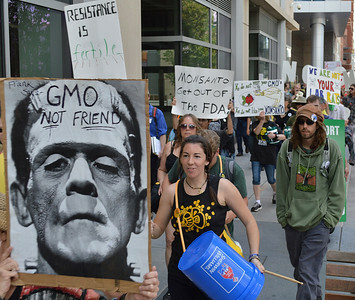 "Frankenstein's monster", woman marching with drum, other anto-GMO protesters marching. 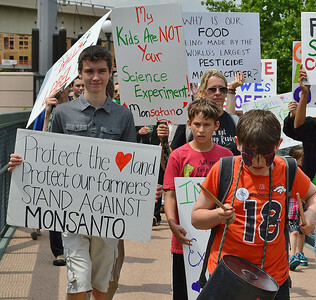 Young boys marching with signs about farmers, GMOs and Monsanto, one boy banging on drum. 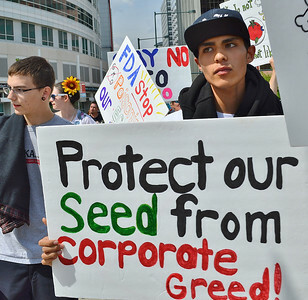 Young man with sign about seed and corporate greed, other GMO protesters in the background. 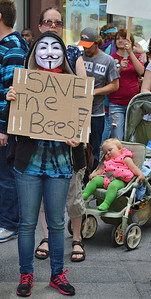 Anti-GMO protester wearing "anonymous" mask, holds signs about bees, next to them a young child sleeps in stroller. 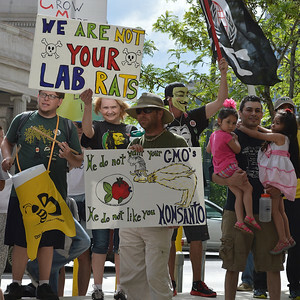 Anti-GMO protesters shout, another wearing "anonymous" mask, one pushes sleeping child in stroller. 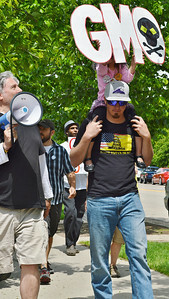 Young father carries small child, other marchers with anti-Monsanto/GMO signs, behind them. 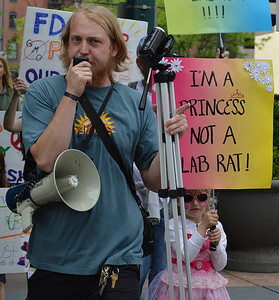 Anti-GMO protester speaks through bullhorn while carrying video camera, young girl in "princess" costume with sign, next to him. 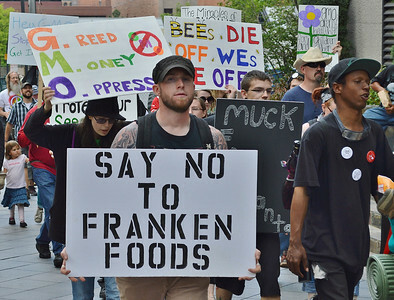 Woman marching and chanting, raising anti-GMO sign above her head with picture of "Frankenstein's monster" on it, other marcher with sign beside her. 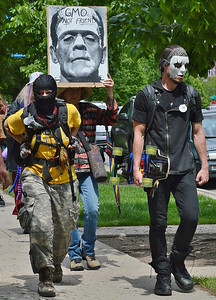 Masked protesters in march, another marcher with "frankenstein's monster" sign behind them. 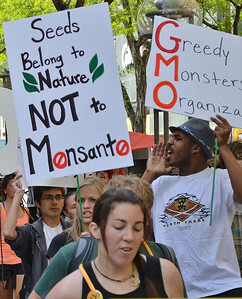 Young woman shouts while marching, holding sign about the working class, another protester with anti-GMO sign beside her. 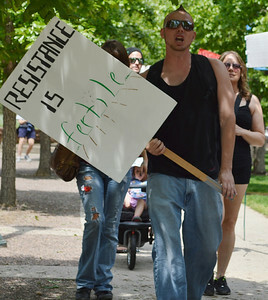 Anti-Monsanto marcher shouts while carrying "Resistance Is Fertile" sign. 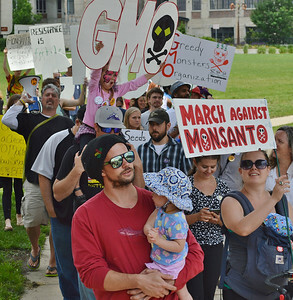 Child carries anti-GMO sign while riding on father's shoulders. 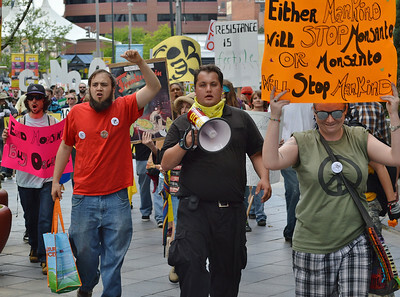 man with bullhorn next to them. 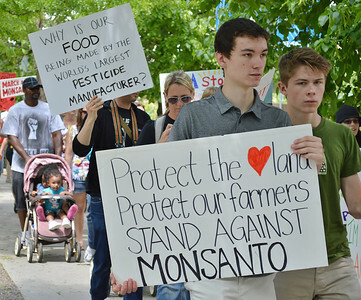 Two young boys march with anti-Monsanto sign about farmers, another with sign about pesticides behind them. 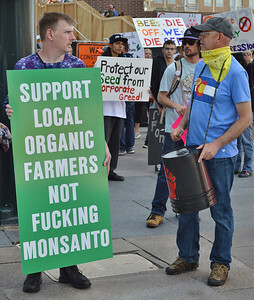 Protester with sign at anti-GMO march, beside him, protester with bullhorn, wearing bandana over face. 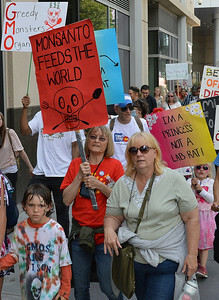 Marchers with anti-Monsanto signs, young boy in front of them, young girl in "princess" costume behind them. 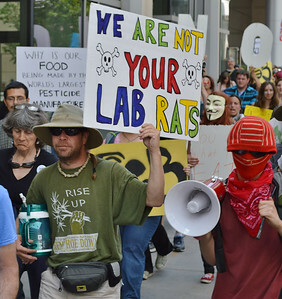 Anti-GMO marchers with signs, one with mask. 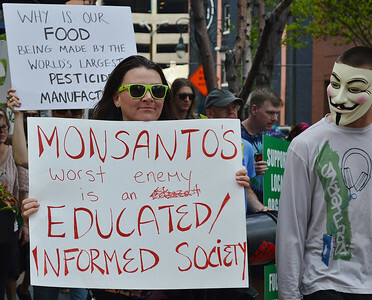 Protester wearing "anonymous" mask, next to woman with anti-Monsanto sign. 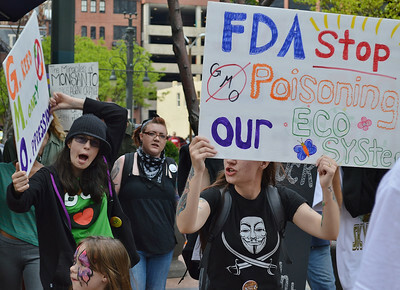 Protester with "anonymous" t-shirt holds up sign about FDA and GMOs, another marcher beside her shouts. 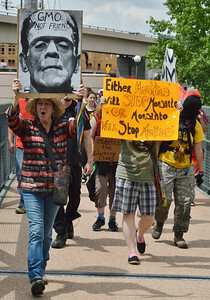 Anti-Monsanto marchers, one with bullhorn, another raises fist in air. 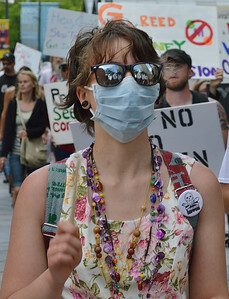 Woman with anti-Monsanto button, wearing surgical mask, other protesters with signs march behind her. 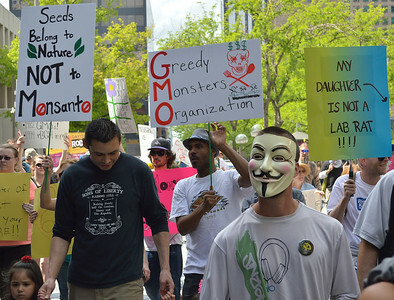 GMO protester with "anonymous" mask, other with signs in background. 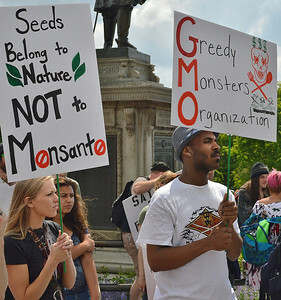 marchers with anti-GMO/Monsanto signs, one African-American man turns and shouts. 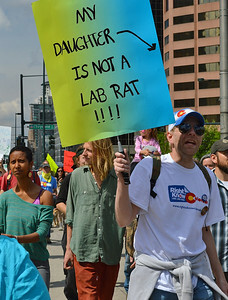 Anti-GMO protester wearing "Right To Know" t-shirt, holds sign "My Daughter is Not a Lab Rat". 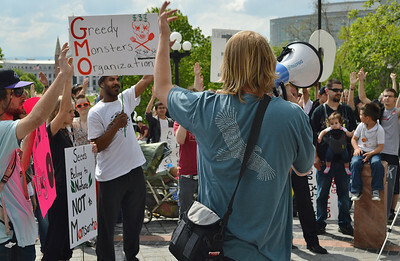 Man raises hand while speaking through bullhorn to crowd of protesters with anti-GMO signs. 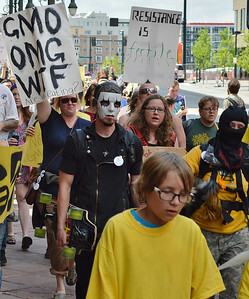 Anti-GMO protesters, one holding 2 children, another wearing "anonymous" mask, other with signs. 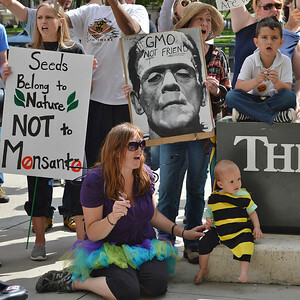 Young child in bee costume next to mother, young woman with anti-Monsanto sign and woman with "Frankenstein's Monster" sign, behind them. 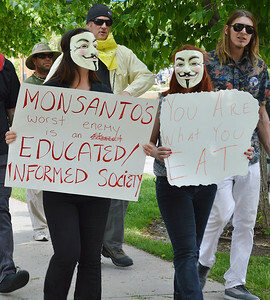 Two demonstrators wearing "anonymous" masks holding anti-Monsanto signs. 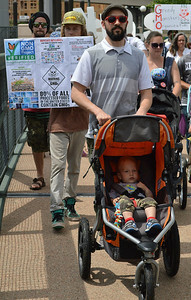 Father pushing young child in stroller, marcher with anti-Monsanto sign behind him. 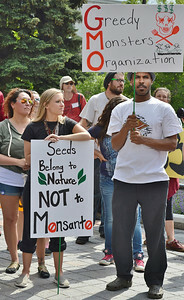 Protester with ant-Monsanto sign about organic farmers.